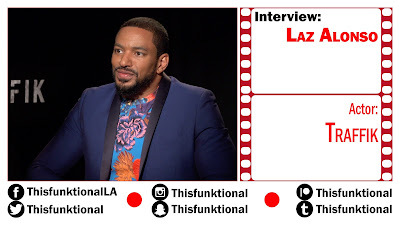 Actor Laz Alonso talks with Jesus Figueroa, @Thisfunktional of Thisfunktional.com, about his role as Darren in "Traffik." Alonso talks about filming in a secluded spot in Sacramento away from society and cell phone reception, getting to improve many lines and seeing how well the role came together and what he came away realizing once this project was done. 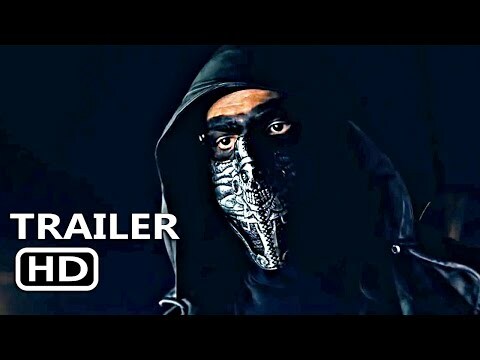 In the action-packed thriller, “Traffik,” plans for a romantic weekend getaway at a secluded mountain estate turn to terror when Brea (Paula Patton) and John (Omar Epps) accidentally discover the hidden world of a brutal biker gang. Joined unexpectedly by their friends, Darren (Laz Alonso) and Malia (Roselyn Sanchez), the foursome is forced into a deadly fight for their lives against the gang who will stop at nothing to keep their dangerous secrets from getting out. The film is written and directed by Deon Taylor, and produced by Roxanne Avent, Paula Patton and Taylor. Codeblack Films, a division of Lionsgate will release the film wide on April 20, 2018.